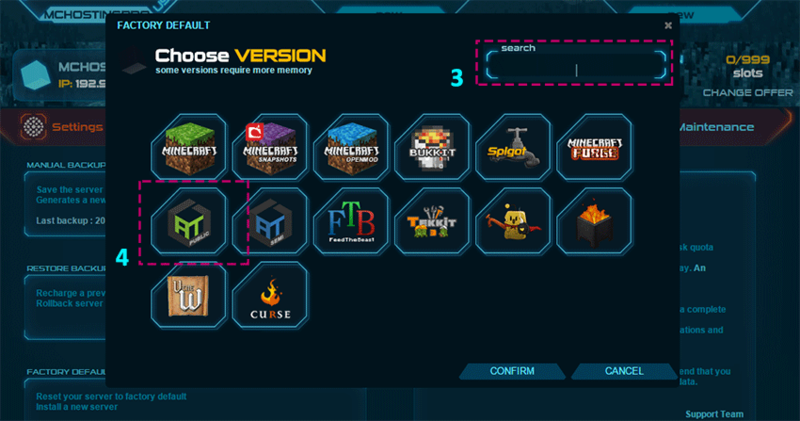 For "normal" packs: Vanilla, Snapshot, Craftbukkit, Spigot... You just need Minecraft Launcher. Now we can begin, you can easily change version or pack on your server. 1. Go to "Maintenance" panel. 2. Click on "REINSTALL". When you reinstall the server, your current data will be lost to install a new pack. 3. Search a pack or modpack to install in search tab. 4. If you don't know exactly the name of the version, you can navigate through PACKS. 5. Then click on "Confirm" when you have selected your pack to install. 6. Finally click on play/start button to launch the server. If your server doesn't start, if you have an error, change java 7 / 8 version on "Settings" panel or read console to find what. Some updated modpacks can have a mod which can crash server. Identify the error on the "Console" panel to find red lines. After that disable the mod by FTP access. (Read FTP tutorial).